Around the same time Style Council’s Confessions of a Pop Group was released on iTunes, the Jam’s Snap! was also made available, this time in its entirety. Paul Weller‘s earliest and perhaps most definitive aspect of his career, The Jam took on a mod identity (much like the Who and Small Faces during the 1960’s) for a new generation of the late 1970’s and early 1980’s, and their music shared affinities for power pop, punk rock, sixties rock, and Motown and Stax soul. 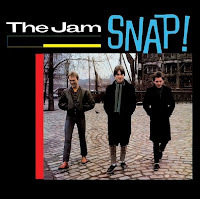 While there are many Jam compilations out there, Snap! is the most comprehensive of the collections, offering the hits such as “The Modern Word,” “That’s Entertainment,” and the R&B swansong “Beat Surrender,” and giving the listeners what other anthologies may or may not offer, such as “Man in the Corner Shop” and “Absolute Beginners” (one of my all-time favorites). Here, the listener can follow the Jam’s evolution and see how they went from playing like the Beatles and the Who to the soul style foreshadowing Weller’s work with the Style Council and his solo career. An absolute must for any fan of Paul Weller and/or the Jam, but also a great introduction to anyone discovering this legendary band’s music for the first time. While these albums may have been on my iPod for a while, they deserve some mention. Lloyd Cole, Antidepressant. The brainy and handsome Lloyd Cole has long toiled in obscurity, whether with his band from the 1980’s, Lloyd Cole and the Commotions, or his own solo work. The follow-up to Music in a Foreign Language, Antidepressant shows Cole as literate and artful as ever, ranging from Leonard Cohen-eque ballads (“NYC Sunshine”), witty story songs with some jangle (“Antidepressant”), and the memorable closer “Rolodex Incident,” which highlights the more instrumental aspect of Cole’s music. Antidepressant is a mature album by Cole, definitely one that won’t be dated in years to come. Wilco, Sky Blue Sky. Putting behind the Radiohead-ish experimentation of Yankee Foxtrot Hotel and A Ghost Is Born, Wilco‘s latest effort is anything but ordinary. However, their dabbling with the sonic palette in those previous releases pays off in Sky Blue Sky. Most of the songs may be slower paced and more conventionally structured, but you can’t ever accuse Wilco of being boring. Sky Blue Sky may be one of their most country albums in a while (as evident in “Impossible Germany”), but definitely not in the same class as the commercial monstrosities that define country music. Smashing Pumpkins, “Tarantula.” One of the 1990’s most interesting acts, Billy Corgan and company managed to defy genres in an era heavily fixated on them. Synthesizing heavy metal, goth, power pop, and new wave into something uniquely theirs, the Pumpkins were heavily prolific with their dramatic style. After an eight year absence, Corgan, Jimmy Chamberlain, and company teases old fans and a new generation of listeners with “Tarantula,” a song off the upcoming album Zeitgeist (due tomorrow). Reminiscent of “Bullet and Butterfly Wings” off Mellon Collie and the Infinite Sadness, “Tarantula” shows the Smashing Pumpkins can compete with contemporary, but comparable bands such as Muse.